Private-equity firm KKR & Co. is considering a bid for television distributor Entertainment One Ltd. after the owner of the preschool cartoon character Peppa Pig rejected an offer from U.K. broadcaster ITV Plc, according to people familiar with the matter. KKR is studying a potential proposal, though no final decision has been made and it could still decide against pursuing it, said the people, who asked not to be identified because the deliberations are private. An acquisition would help KKR expand into media and entertainment, an industry where the New York-based buyout firm has been looking to grow, one of the people said. Representatives for KKR and Toronto-based Entertainment One declined to comment. Entertainment One rejected ITVs 236 pence-per-share takeover proposal on Aug. 10, which valued the business at about 1 billion pounds ($1.3 billion). The Canadian company said the bid was too low but suggested it would be open to a higher one. 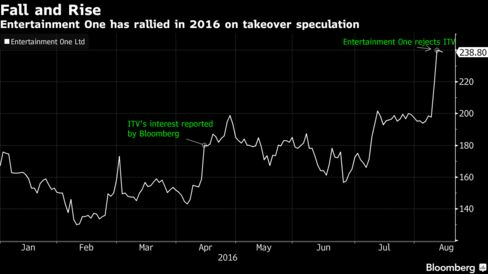 After slumping earlier this year, Entertainment One shares, which are traded in London, have surged since Bloomberg News reported in April that ITV was pursuing a takeover. The shares closed at 238.80 pence on Friday in anticipation of a potentially higher ITV bid. Entertainment One distributes TV and films in Canada, the U.S., Australia, the U.K. and several European countries. It has worked with titles including this years Academy Award winner Spotlight as well as Fear the Walking Dead and The Hateful Eight.